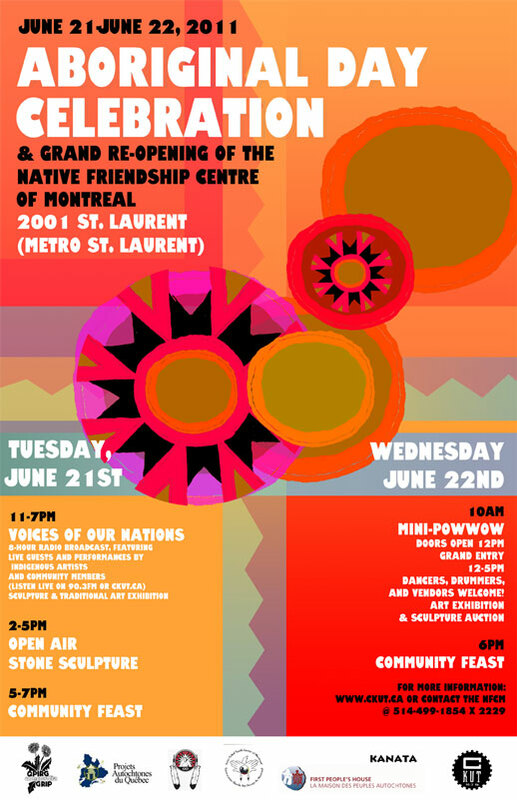 The Native Friendship Centre of Montreal (NFCM), the Inter-Tribal Youth Centre (ITYC), and Radio CKUT, 90.3FM to celebrate Aboriginal peoples, the summer solstice, and the grand re-opening of the Native Friendship Centre of Montreal after months of massive renovation. *LAUNCH of Native youth hip hop and rap musical productions. Over the last six months, youth at the ITYC have produced a repertoire of songs as part of the their monthly radio program, Native Solidarity News on CKUT, that will be performed and played during the Voices of Our Nations broadcast. 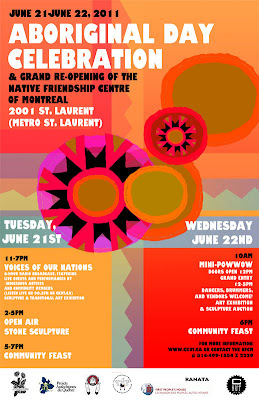 5-7pm COMMUNITY FEAST, share in traditional foods prepared for the community, free!